Yesterland.com: Texas Disney Theme Park? Texans hear from their friends or business associates that Disney is building a theme park in Texas. To learn more, they Google “Texas Disney Theme Park?” or something along those lines. Google returns a list of results, with this Yesterland article at or near the top. Please enjoy this updated look at the Texas Disney myth. Disney theme park rumors have been smoldering in the Lone Star State for a long time. The whole article seemed oddly familiar. That’s because much of the wording was lifted from a 2011 April Fools Day piece in The Woodlands [Texas] Real Estate News blog. Compare the Waller County paragraph above to the Woodlands paragraph below. It doesn’t require an intentional hoax to keep Texas Disney rumors alive. It just takes some wishful thinking, perhaps in combination with a misunderstanding of an actual real estate transaction. There have been rumors year after year that Disney bought this site or that site in various locations throughout Texas. Not one of these rumors has ever turned into a real announcement. In January 2007, the Texas rumor had a Super Bowl twist. Internet forums had messages such as, “I just heard on the radio here in Dallas that a new Disneyland is coming to Frisco, Texas! The announcement will be revealed in a Super Bowl ad!” and “My wife just returned from getting her hair done. The hairdresser told her that Disney is going to be announcing a new theme park on Super Bowl Sunday. Said park is rumored to be located in Frisco, Texas.” Some Disney fans watched the game just for the announcement. The game ended, and—surprise!—there was no announcement. If you think about it, the Super Bowl rumor didn’t make business sense. Would Disney really be willing to give CBS $2.6 million for 30 seconds to promote a park that wouldn’t be open for business until many years later? And why would Disney spend that kind of money when a simple press release and media package would produce far more publicity for free? Edited image based on a photo of “it’s a small world” at Disneyland by Werner Weiss, 2009. Texas is a big, big state. A rumor in April 2008 claimed that Disney had bought 15,000 acres near Celina—and “already had the water rights” (extra information such as this apparently makes rumors more believable). A rumor in April 2007 claimed that Disney bought Six Flags Astroworld to convert it into a DisneyQuest. 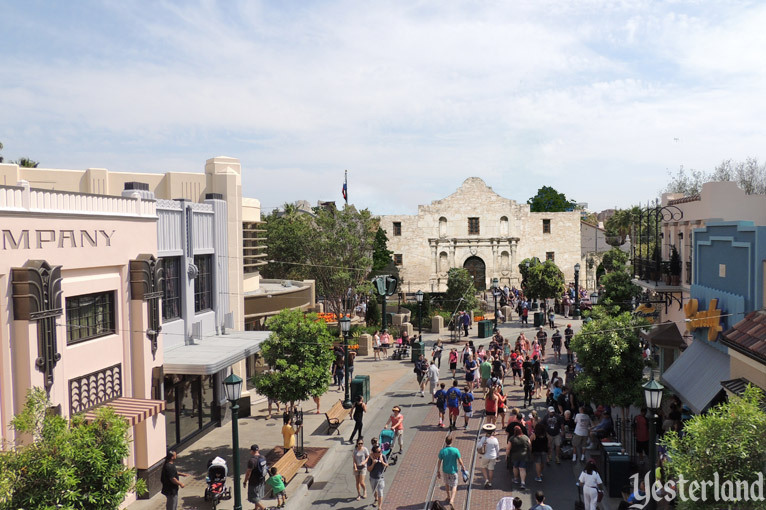 Then, in May 2009, the story was that Disney bought Six Flags Fiesta Texas in San Antonio. 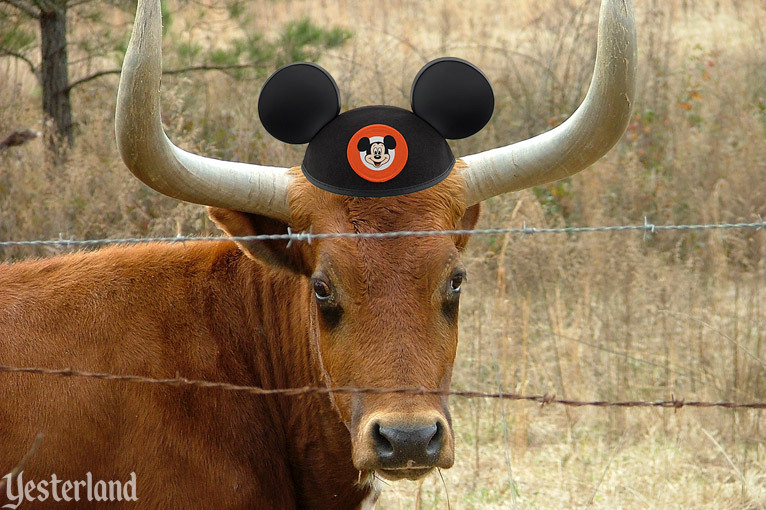 Another rumor in March 2010 identified Disney’s site as a large cattle operation near Bastrop in the Austin environs. Walt Disney Parks & Resorts scheduled a press event in New York City for September 23, 2010, with a promise to unveil “some exciting plans.” There would even be a live webcast. Once again, the Texas rumor flared up, along with all sorts of other predictions. The “exciting plans” turned out to be a preview of Disney’s marketing campaign for 2011 (“Let the Memories Begin”), an announcement that Disney would be projecting photos of park guests onto Cinderella Castle in Florida and “it’s a small world” in California, and reminders of previously announced additions for 2011, such as Aulani in Hawai‘i and the Disney Dream cruise ship. We don’t know who owns this property... so it must be Disney! 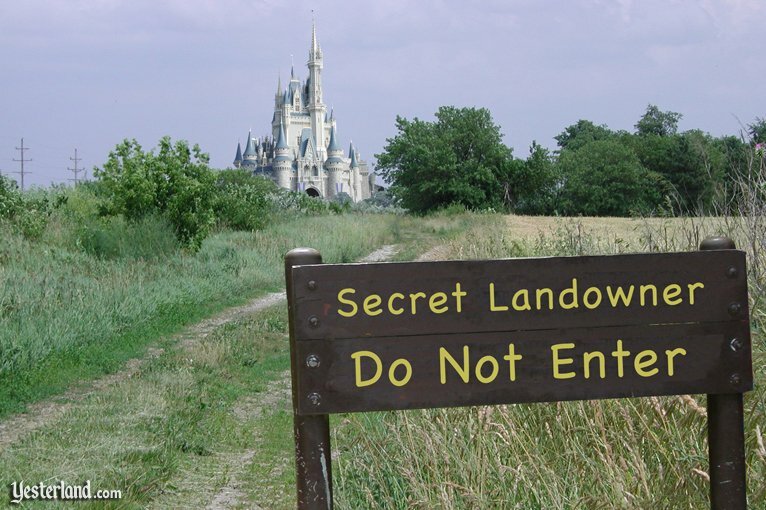 Some of the Texas rumors have claimed that Disney already secretly bought vast amounts of land in Texas. The inspiration for such stories is easy to imagine. There are people in Texas who expect history to repeat itself. So when a large Texas cattle ranch changes hands, it can mean only one thing, right? It must be the Disney Company! Of course, in reality, a lot of other companies buy real estate. And it’s not the mid-1960s any more. Between the enhanced financial disclosure requirements of the Sarbanes-Oxley Act of 2002 and the greater speed with which information travels in the Internet era, a repeat of the strategy of 1964-1965 is probably impossible. 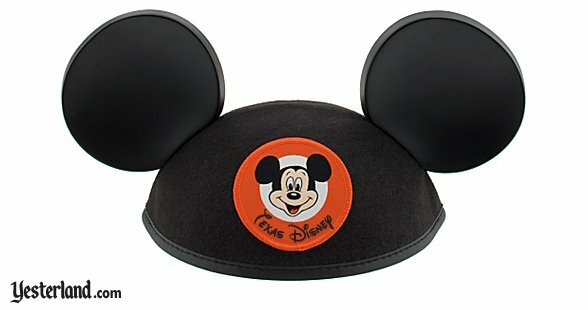 Search any of the Disney forum websites, or just do a Google search. You can spend all afternoon reading rumors of Disney parks going into Texas. If the Texas Disney rumors were all true, Disney would now have parks planned for Austin, Bastrop, Beaumont, Brookshire, Castroville, Celina, College Station, Columbus, Conroe, Frisco, Frelsburg, Huntsville, Katy, Houston, Lampasas, Lubbock, Magnolia, McKinney, Melissa, Midland-Odessa, Montgomery, New Caney, New Waverly, Paris, Prosper, Round Top, San Antonio, Sealy, Streetman, and Woodlawn, Texas—and undoubtedly other Texas cities too (but I got tired of reading Google search results). But could one of the rumors possibly be true after all? If Disney ever wants to build a third major destination resort in the United States, then Texas is probably the best state for it. There are parts of Texas whose climate is not much worse than Orlando’s, making all-year operations possible. Like California several decades ago, Texas has a large and growing population—providing a lot of potential local guests. 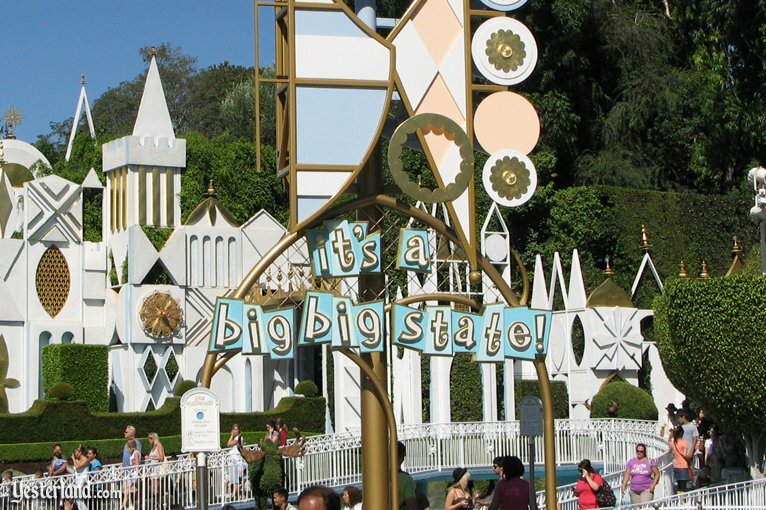 According to the U.S. Census Bureau, the state’s estimated population in 2012 was 26,059,203—twice the population of California in 1955 (13,004,000) when Disneyland opened. Texas is the number two state in population. The state is well-served by airports and airlines, providing easy access from much of North, Central, and South America. However, a major Disney theme park in Texas is highly unlikely at this time. Speaking at the Merrill Lynch Media Fall conference in New York in September 2007, Thomas Staggs, who was then Disney’s Chief Financial Officer, confirmed that Disney has no plans to develop another major theme park in the United States in the “foreseeable future.” There have been no credible reports that anything has changed since then. Until Disney management feels that a third destination resort in the United States would result in considerable new business—rather than just cannibalizing Florida’s Walt Disney World and California’s Disneyland Resort—any new Disney destination resorts are likely to be overseas. At a February 2007 Investors Conference, Jay Rasulo, who was then the Chairman of the Disney Parks and Resorts business segment, spoke about developing themed hotels and shopping districts away from Disney’s two major U.S. locations. In October 2007, Disney announced plans for a resort at Ko Olina on O‘ahu in Hawai‘i. And in May 2009, Disney announced the purchase of a 15-acre site at National Harbor near Washington, D.C. So far, Aulani at Ko Olina is the only project of this kind. Disney withdrew from National Harbor two and a half years after buying the site. Disney seems to have put the concept of regional Disney hotels or shopping districts on hold since Rasulo’s 2007 statement. If Disney decides to follow up Aulani with a similar project in another state after all, a minor Disney presence in Texas would not be unreasonable. Texas may not have quite the tourist appeal of Hawai‘i, but it has some lovely areas—and plenty of people who might enjoy an in-state Disney resort. The press in Texas isn’t nearly as optimistic as the press in Florida in 1965. Oh, and there’s no major Disney theme park being built in Branson, Missouri, either.